I have lost my temper so often since I moved to the Middle East, I don’t even recognize myself. I’m angry and shouting and horrible – horrifying to anyone who knows my egalitarian heart – mystifying to my conflict-adverse husband. Perhaps my uncharacteristic bouts of hair-singeing expletives could be attributed to culture shock. But this being my third year abroad, I’m not sure that behavioral escape clause still applies. I have no safe harbor for my behavior, not even under the umbrella of American tourism, to which the world grows increasingly leery to open its doors. The emotional distance I travel in one day contradicts the semi-permanence of making of three years in the Arabian Gulf. “I hope you die,” I mutter to the driver of the Toyota Land cruiser for flashing his lights in my rearview mirror. He races towards my bumper, despite the fact that someone else, same car, same make, model, and color, is in the right lane next to me, providing no place to maneuver. Neither male driver appears over the age of eighteen, I can tell, because neither has a beard or the white headscarf traditionally worn with the starched thobe, the male national dress in the Gulf States of Kuwait, Saudi Arabia, Qatar, Bahrain, and the United Arab Emirates. White thobes worn with exposed white prayer caps, the covering underneath the headscarf, are what fashionable young men wear as they cruise around the city in SUVs with three digit license plates, this country’s DMV equivalent of vanity plates, priced at over $13,000 each. My vengeful thinking is contextual, given the State department’s rating of traffic fatalities as the primary cause of death in Doha, the city-state capital of Qatar where I have made my home. Knowing driving related injury is a high possibility for the drivers on my right or left doesn’t cause a tingle of guilt for what I’ve just said, despite my Hindu upbringing. Even the image of my mother – covering her mouth, delivering an excruciating pinch to my brother or me if we dared imagine misfortune out loud – not even these memories make me remorseful for what I’ve said. The Land Cruiser beside me darts ahead, opening a space in the traffic flow. I move into the next lane before the driver behind me can flash his lights again. He roars by, hitting his hazard to show his irritation at how long it took me to get out of his way. I resist the urge to flip a finger, something I have never done at anyone while in the car, even when driving in New York City. It isn’t over; however, as there are still twenty minutes left in my commute, certain to be littered with similarly-tempered drivers. I must relax if I’m going to avoid a lay over in jail on the way home, a very real consequence for insulting a National. They aren’t necessarily singling me out as a woman driver, since high beaming is a signal used all over the country on anyone odious enough to be driving under 100 kilometers. What is the rush? I’ve always wanted to know this, since there is very little in the way of nightlife or entertainment in the small city. After eleven years of driving in the United States—in California, Texas, Florida, North Carolina, Pennsylvania, Washington D.C.—road rage tracks me down me in Qatar. And if I’m honest, road rage isn’t a fair term, since the road has nothing to do with the mercurial rise in my temperature when I’m waiting on hold for the bank employee to tell me how to reset my online account access. She takes down my information and says someone will call me back in ten minutes after resetting the password. No one does. Three days later, no one has. Nor can I blame bad drivers for the shiver of anger each time the doorbell rings and I see in the peephole the property manager standing on our front porch. He is coming to tell me the power will be shut off because the generator needs servicing. On which magical day will our complex of thirty units appear on the city grid? No one seems to know. These innocuous daily tasks take me to an edge my gregarious personality didn’t know existed. Am I being transformed into the grumpy ex-patriot who thinks everything is run more efficiently in her home country and shares this opinion widely, but somehow refuses to go back, year after year? The ‘tea girl’, a woman my grandmother’s age, scurries past my open office doorway to see who needs a drink, a photocopy, or something heavy to be lifted. Is my REM cycle filled with images of boys hitting their nannies, slaps across the face, for trying to buckle them into their seat belts? Is my subconscious creating visions, as though I too bore witness when my friend heard toddlers lambasting the adult operators of the mall merry-go-round—within earshot of the indulgent parents? Is the insolent “give-me-that-one,” of shoppers in all of the city’s glitzy malls, as they tap on glass display cases to get a store clerk’s attention, recurring beneath my eyelids as my body rests from the heat, dust, and sand of summertime in the Gulf? In Qatar, and the other countries and my husband and I have visited in the Middle East region—Oman, Jordan, Dubai, Bah’ rain, Yemen, and Egypt—the oral exchange between people trumps written discourse. Disagreements are ordinary; but only after someone has said something insulting about the other person, or his/her family, do disputes become volatile. Defacing personal or public property usually results in academic suspension by both host and home institutions. However, in many cases physical or proprietary assault is not what lingers in students’ memories. One particular conflict a friend was mediating had to do with a dorm brawl that spun out of control as female students rained tribal insults on each other. In separate phone calls to discuss the situation, both with family and program administrators, the Qatari students studying in the United Kingdom insist that doing nothing in the face of the oral onslaught was untenable. When I hear about this, it seems the students were engaging in a one-up contest, or the Arabic version of the “Your Mama” joke. Before the cultural awareness trainer, before learning about arguing students, early in the summer of 2005, I was sent on a pre-employment visit. The pre-employment visit is what overseas employers use for final or short list candidates. It amounts to a three day, four-night good will trip to get the lay of the land for the new job, new home, and soon to be host country. The point of this “pre-trip”, as it’s known, ensures ex-patriots don’t lose their nerve during the first few months in the desert climate, wishing for bacon, and scuttle home. During the pre-residency trip, the prospective employee gets all the perks of working in an economy bolstered by oil revenue. You’re sent business class, where airline staff is nicer than anyone has ever been on an airplane, solicitously offering departure champagne and arrival chocolates. You’re whisked from the airport to a five star hotel, where everyone offers world-class service, and doors open soundlessly. Perhaps this was my first warning sign of the dichotomies of life in a wealthy state – during my pre-employment trip I was housed in an unoccupied new residence, in an empty complex like the abandoned set of a Hollywood Western,. Rows of identical two story units with adobe colored facades faced a silent circular street. But the intricacies of the difference in my treatment as opposed to other pre-trips are lost on me, as the intervening days are full of vigor and passion. Three days come and go as I alternate trips to the office, plans for new educational initiatives, and dinners in multiethnic restaurants. I pass jetlagged evenings in the ghost compound, flipping through satellite television channels with multiple Arabic music video stations. During the day I shuttle from one building of marble and glass to another where air-conditioning has a refrigerator’s chilling effect, so I manage to avoid the 110 or higher temperatures outside. After I pack up, I am awake the last night writing proposals, energized by the promise of bringing a unique brand of education to the Middle East. I will be a part of a campus extension of a major American university in the Qatar, part of the consortium of schools gathering under the Qatari initiative for educational reform. I’m responsible for co-curricular programmatic initiatives which will supplemental what students experience in the classroom. Leadership conferences, guest lecturers, and service learning projects all spring to mind during the early hours of the morning. I pack, thinking ahead to when I’ll actually live here and begin to implement these ideas. We head to the airport – last flight of the day as the only option for a trip to North America – satisfied that I are not moving to the tented desert of Laurence of Arabia but to a cosmopolitan and sophisticated place, with ample amenities, meaning I can leave most of my personal belongings behind in North America. The complimentary hor’dourves, wireless Internet, and polite staff of the business class lounge soothe me into writing a note to all and sundry about my upcoming move to this idyllic city-state. The pre-trip has been so successful that it dwarfs another momentous event. Two days from now, a naturalization ceremony will change how I refer to myself, or as my father says, my category. I am going to become an American citizen. After almost twenty years in the U.S. as the child of immigrant parents, growing up from California, Texas, to Florida, I’ve decided to apply on my own. At the end of summer 2005, I am as yet still single, head of my household, an adult. India does not recognize dual citizenship and I will have to surrender my passport or risk arrest for traveling on the subcontinent carrying two passports. The years of watching my father unable to apply for top research grants, reserved for U.S. citizens, override my parents’ mixed feelings about handing in my documents. My father’s blocked professional ambition, in addition to the fact my original pre-trip had been scheduled in late spring and canceled, due to an inability to get a visit visa, required for anyone visiting Qatar on a sub-continental passport, cemented my decision to go through with it. The week in late summer was so glorious it made the botched preparations for the original pre-trip an emotional blip of the recent past. The first time around with arrangements for my visit to Doha was not as successful as this three day visit. I get the call an hour before I was leaving for the airport. Later on in the month was going to be difficult. I was already scheduled to interview and train finalist candidates for my future office staff in the coming two weeks. This was the first tingle I remember about the entire endeavor, even before standing in the people’s compound road, staring at the cream and tan exteriors of my pre-trip lodging with echoes of month long stays at the Four Seasons in my ears. You’re single, female, under thirty, traveling alone, my rational mind tells me, These aren’t things Muslims take lightly. So relax. The whole world’s not racist. Besides the Mughals ran India for hundreds of years. Where do you think they got curry? I breathe through the unplanned week in the U.S. and crush any sound of disappointment on dates with a new beau, both of us playful, knowing there was no need to worry about where any of this was headed. We knew exactly – I was going to Qatar – he was going to California. In the early days of 2005, in January, long before I even knew the country of Qatar existed, the INS letter comes with my naturalization interview date, I am one big smile again. With labeled and photocopied documents sorted into a manila file folder that would have made my father proud, I prepare for the interview. I told him I was using his filing system of folders with overflowing document that had filled our apartments in childhood. “Do yinz want to change your name?” the INS officer asks me. Her townie Pittsburgh accent is familiar now, at the end of my nine months in town, so the yinz does not faze me. She means you. I blink at her for another reason. I know it’s a long one and often people think it’s odd that a Hindu convert to Christianity would keep Lakshmi, the goddess of wealth, as her legal identity, but I cannot comprehend answering to anything else. “No,” I say. “This is my name,” I add, sounding more like my father than I ever thought possible. The INS officer shrugs, offers no congratulations, and proceeds down the list. I look at her again. She is blue-eyed and blonde, but hard, her skin fading, maybe too much fluorescent light in these government offices, blue-green veins starting to show on the sides of her neck. Nine months in Pennsylvania is just enough time to qualify for residence to apply here before my move across the world, a move that will take me to only four hours from where my life started, closer to the subcontinent than my brother, sister, or parents. Two weeks before I moved back east, I was becoming an American, my life swinging East and West as it had since my father moved us to Canada when I was five. “Speaking real good English and all, the Rotary likes to have someone say something during these things. Yinz mind if I recommend ya?” She asks, pen hovering above the last box on the form. I nod and with that we are done, the entire interview taking less time than an oil change. She tells me I’ll get the ceremony date in the mail and pushes back from her desk. The letter comes and the ceremony is scheduled for two days after the rescheduled Qatar pre-trip. I hesitate when I realize the forty-eight hour window within which I will make the fourteen-hour journey back to the U.S. East coast. Mentally I flex against my instinctual resistance at this sandwiching of two important events in such short span of time. This was the jet-setting life I’d always planned for myself so I resist the urge to ask our travel agent to bring me back on Tuesday, instead of Wednesday, the day before the ceremony, not wanting to cut short the trip my supervisor had been reluctant to reschedule. “Madam, we will call your flight,” the lounge attendant says. I’ve gathered my things and am heading to the gate, despite the flight not being called. Thanks to my years of accent assimilation, begun at age five, the local Rotary Club has asked me to give a speech on what becoming an American means to me on behalf of the other two hundred people being naturalized during the courthouse ceremony the same day I am. “Oh, if there’s one flight I can’t miss, it’s this one,” I reply on my way out the door. I get to the gate, first class ticket in hand, and queue patiently, though technically I can go to the head of the line. I wait with others, until I get to the gate attendant. He is dark skinned and dark haired like I am and after looking at the cover of my passport, the three headed gold embossed lion, asks me to step aside for five minutes. I show my green card, from the era when they still looked like driver’s licenses, not the modern credit-cardish models my other immigrant friends have. The attendant flips through my passport and motions me to stand to one side. I’m still buzzing with excitement to get home and happiness at the life I’ll find when I return to Qatar, so I do as he says. Ten minutes later I ask if there is a problem. Thirty minutes later, the flight departs without me. Seven days earlier, men had boarded subways in London with explosives. There were fatalities, countless injured. My return route was through Heathrow International airport. I had an Indian passport, American green card, but no transit visa. I missed that flight and two others, all hope of making my citizenship ceremony ticking away as I repeatedly explain to airport security, “I’ve just come through Heathrow three days ago. They didn’t ask me for a transit visa.” None of the security staff look me in the eye. None of them pause to listen to my explanation. “This is my bread and butter ma’am,” one young man says to me, palms up. “I have to get to Pittsburgh by eleven a.m. on Thursday,” I hiss. I return to the silent studio set, the villa I’d left, giddy with excitement, just a few hours ago. I cry myself to sleep, wondering what to tell my family, who were nervous about me, the first member to surrender her Indian passport. The travel agent is unreachable, and the morning wasted between calls to the American Embassy and the British Consulate. “Do you realize you are preventing me from doing the one thing that will keep me from being in this position again?” I ask the British Consulate officer on the phone, when I’ve been denied boarding to the last possible flight to the East coast of the United States. The irony doesn’t matter to him, nor the fact I kept repeating, that I had made it to Doha from London without a transit visa, so why would I need one on the way back? Logic, it seemed, doesn’t apply – not to him, or to airport security, or even to my coworkers, unfazed by my distress, back at the office, working. A boon not granted twice by the British, I realize, as the ticketing agent explains. Barred from England, I’m left with only one possible twenty-hour itinerary. Doha-Bahrain-Amesterdam-Detriot-Pittsburgh – economy class all four flights as the business cabin is sold out for the next week. During the first of the two five hour layovers, sitting in the airport lounge in Bahrain, barred from the business class lounge, at three a.m. I type an email to the Pittsburgh INS office and talk on the cell phone until the battery runs completely out. Two hours later, I clamber onto aircraft, stuffing myself in the cramped cabin space, the thoughts come: could I divert the plane to Pittsburgh? Could I tell someone my story? Would my father be despairing, furious, foaming? Mostly I watch movies and fight tears, not looking up when the terse flight attendant passes through with meal service. If there is one time you want someone to be nice to you, as they are in business class, it’s when your world is crumbling. After fifteen years abroad, my glorious entrance into Americana is ruined by the very fact of my Indianness. I land on American soil in Detroit, Michigan, one hour before the ceremony starts in Pittsburgh, Pennsylvania. I race through the terminal to catch an earlier flight to Pittsburgh and the second plane lands one hour after the ceremony finishes. The minute the plane lands, I’m on my mobile, calling the soon to be ex-beau, who in some twist of fate only possible in romantic comedies, is scheduled for the same naturalization ceremony as me. “Emotions are high,” he says, and I close my eyes against the background sounds of the Rotary reception in the Omni hotel. He couldn’t have put the situation more succinctly. My heart constricts as the image of the INS officer pops up. I try to deplane without giving one any cause to report me to the Department of Homeland Security. He says he’ll find the people in charge of the ceremony and call me back. In the meantime I pick up the keys of the rental car and race to the garage, thankful for my carry-on only rule for trips under five days. The phone rings and I’m imagining laughs at dinner over this near catastrophe. I am heading through the tunnel, over the bridge into the city, summer sunlight pouring onto the river below, and my travel worn mind just gives in. A shower, I think. If I could just get a shower, everything might be okay again. Now that I’ve lived in the Gulf for three years, I know how unnecessary those days of agony were – I could have given my speech on the failure of the modern American community and the call to arms to better represent us in the world – logic wasn’t the golden key, but wasta. All I needed that moment in the airport was a cell phone with the number of someone with influence, someone who knew someone, who could get in a word for me and override my Indianness with his or her importance. As I greet members of the diplomatic community on a monthly basis, I know that any one of them could have eased me onto a plane home. I nod, because this is what my parents have instilled in me the minute the front door shut on any of our various apartments. I find out that most of the people he means are the migrant labor force, construction workers often lured abroad with promises of ample salaries and steady work. They find ten-hour days with little pay, squalid living conditions, and a monetary situation only marginally better than what was at home. They’re barely able to pay off the fee to the recruiting agencies that have brought them here. I’m safe from all of this, as a Western educated professional hired by an American company who pays market value wages, regardless of nationality. Yet, despite my American passport, the local immigration authorities insist my residence visa must be processed on my Indian passport, and then transferred to the new one. “Indian” all my documents read despite having surrendered it. The Sri Lankan cleaning crew wants to make friends and I manage pleasantries although our dialects of Tamil are different. The Pakistani tailors want to know more about my Chinese looking husband and I offer that he was born in Richmond, Virginia to Lao immigrants who grew up in Thailand. The American wanderlusts want a personal tour of India, designed by me. I want to make it a day without incinerating the vanfulls of men around the city, who glance once, then elbow their seat mates to get a look at me, many of them away from their families for over two years. I want to wait patiently for my change at the gas station, even though the guy next to me is staring at me in a very un-Muslim manner, which causes me to drive off in order to avoid an altercation. I’m caught in a socio-economic whorl of my own making – I drive myself, take my own car to get washed, the tire fixed – in a culture where status means I should do none of these things if I am a woman of consequence. I try to find the humor and tell my Qatari co-workers of the silent customer lounge area I shared with two men while waiting for my car to be washed. “Don’t you have someone to do this for you?” my male colleague asks. Even though it is legal for women to drive in Qatar, brothers or husbands drive the women whose families don’t have drivers. The rest are escorted around the city by drivers, most of them from the subcontinent, accompanied by a maid, to prevent any untoward between the passenger and her employee. One of these males, drivers, brothers, husbands, handles errands that involve associating with any non-relative males. Not in my case; my husband would love to do this for me but his eighty hour work week prevents it. Am I a member of the elite workforce, with forty days of vacation and round-trip business class airfare? Or am I a worker, literally someone who works, in a country where the average median income is over $60,000 and neither spouse works full-time? The touch and go glamor of pre-trip hinted at these questions then forced them out into the open at the trip’s delayed end. Getting locked out of a flight was a first in my globetrotting existence, and an intimate encounter as life as persona non-grata. An emotional and humbling experience I can now think of a hundred ways out of – but I’m oddly comforted I won’t have the opportunity to revise. Maybe because in this failed episode, I was lucky to see traces of disparities – a lesson my father tried to imprint on us in grade school – which circled around to find me in adulthood. “All that glitters is not gold,” he would say, watching me bounce out of the house through a revolving door of friends. Pessimistic, I thought of this saying, not unwarranted given his experience as a foreign intellectual during the height of Reagonomics. I sit rapping a pencil on the desk, thinking of the security guard who refuses to give me access to the parking lot of the main building, necessitating prior phone calls from my colleagues to assure him that I am, in fact, okay to park there. The phone rings, preventing me from plots to get him a dressing down from the university president herself. It’s Fatma from the bank. She’s calling, one week later; to tell me she has reset my password for my online banking access. A feeling like melted sorbet rushes upward from my chest so the top of my head tingles. I hang up the phone, a few keyboard taps later, my password changed to something I can remember. The tingling feeling stays with me all day. I’m tingling even during the drive home and on into the night, as guests arrive for a dinner party. We are sitting on the couch, commiserating about life as ex-pats, and I tell everyone about Fatma remembering to call me, even on Thursday afternoon, the start of the weekend. They seem a little surprised by my effusive smile. As they chortle into their wineglasses, I relish the tingling feeling, trying to remember the exact sensation so I can recall it the next time I get into the car. 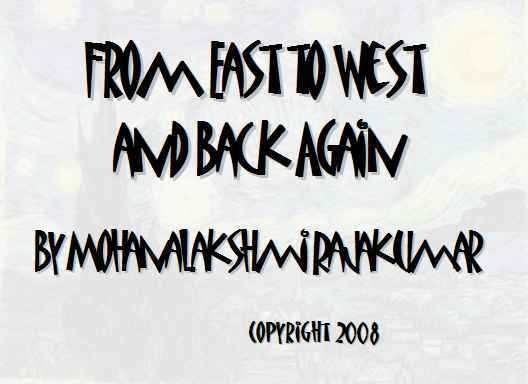 Copyright 2008, Mohanalakshmi Rajakumar. © This work is protected under the U.S. copyright laws. It may not be reproduced, reprinted, reused, or altered without the expressed written permission of the author. Mohanalakshmi Rajakumar (or Mohana in everyday life) is a writer and educator who lives in Doha, Qatar. She contributes regularly to Woman Today magazine, reviews for Audiofile magazine, and is an international columnist for EducationNews.org. As founder of the Doha Writers’ Workshop, and Educational Consultant at Qatar University, she supports the development of writers both at the undergraduate and community levels. She has published a number of short stories and is currently working on a collection of essays about living in the Middle East. A soon to be graduate of the University of Florida with a Ph.D. in Postcolonial Literature, Mohana believes that words allow us to understand how we think about ourselves and others. Keep an eye on her latest goings on via her blog at mohanalakshmi.livejournal.com.